The two ad writers behind the "Banquet" ad spot won't be banished to the pit of misery anytime soon. The hit tagline was originally written into the script only once. Let’s raise a toast to the latest round of Super Bowl commercials, often as widely anticipated as the big game itself. Placentra, 30, an art director with the Wieden + Kennedy ad agency in New York, said he and copywriter Alex Ledford invented “Dilly Dilly” out of thin air while spit-balling ideas for a Bud Light commercial called “Banquet” that began running in August. The original script used “Dilly Dilly” only once, but the client liked it so much Placentra said director Jim Jenkins suggested using it multiple times. The phrase went viral, sparking a pop culture phenomenon akin to “Wassup” and “I Love You, Man” phrases from commercials of years past — printed on T-shirts and used in memes online. One independent beer-maker introduced an unauthorized “Dilly Dilly” ale that later was pulled. Pittsburgh Steelers quarterback Ben Roethlisberger used “Dilly Dilly” as an audible call at the line of scrimmage in a game against Tennessee. It’s pure gold all advertisers and their clients hope for, but which often comes down to luck. Bud Light feels “Dilly Dilly” is on a lucky roll because it’s added seven spinoff commercials, including two new national spots the past month and a 60-second ad to air during Super Bowl LII. And given the cost of Super Bowl ads topping $5 million for a 30-second spot, viewers had better be hooked. Kantar Media said the average price of a 30-second Super Bowl commercial jumped 87 percent the past decade, from $2.7 million in 2008 to $5.05 million a year ago. Last year’s biggest ad spender last year at $35 million was Anheuser-Busch InBev, the parent company behind Bud Light. Is it worth it? Not always. Master Lock once famously spent three quarters of its annual ad budget on one Super Bowl commercial before finding better value elsewhere. But such ads might benefit companies such as Budweiser parent AB InBev with exclusive Super Bowl marketing rights for their product — in this case, beer. A joint “Super Bowl Ads” study by researchers at Stanford University and Humboldt University in Germany recently found that for some advertisers long associated with the big game, the benefits of Super Bowl ads persist well into the year. Budweiser was featured prominently in the study, which estimates sales of its beer increase up to 10 six-packs per thousand households the week preceding the big game. In addition, the study states that in markets where Super Bowl viewing is higher in a given year, Budweiser sales increased during subsequent big sporting events such as the NCAA’s “March Madness” and MLB and NBA matchups. The study says Budweiser sales volume jumped as much as 3.9 percent and revenues as high as 4.7 percent in response to Super Bowl ads that ran during ensuing weeks. 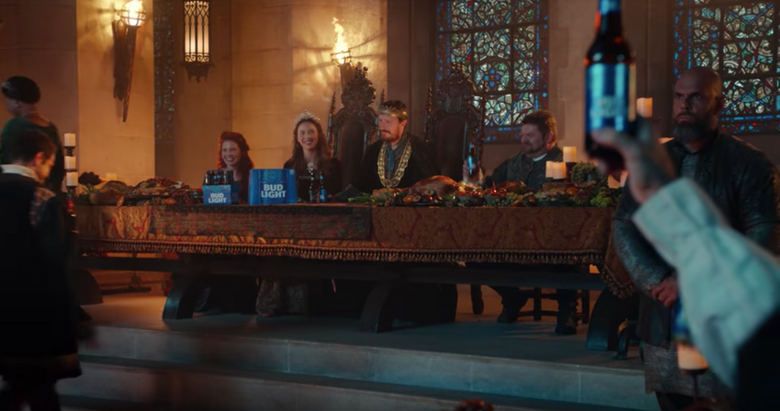 It’s no surprise that AB InBev is doubling down — no, make that tripling down — on its “Dilly Dilly” campaign to help its struggling Bud Light brand ahead of the Super Bowl between the New England Patriots and Philadelphia Eagles. It introduced a “Wizard” ad on Christmas Day, then a “Ye Olde Pep Talk” spot on Jan. 21 during the conference championships. The third spot in its Super Bowl “Trilogy” will air during the Feb. 4 game, with Las Vegas issuing prop bets at the number of combined “Dilly Dillys” in all Bud Light commercials at an over/under of 15.5. Bud Light also ran specialized “Dilly Dilly” promotional ads for all four teams from last week’s conference championship matchups. Inevitably, there has been social-media backlash from those fed up with “Dilly Dilly” ads. For now, at least, it appears Bud Light will file that under “any publicity is good publicity” and keep going.